I love having something pretty on the table, and since I like to change things out all the time, something easy is always top priority. Here is a little sneak peak at a DIY centerpiece. I think we all have a bottle brush tree or some kind of a small tree in our stash. Making it look important is just a matter of elevating it in a special container and adding some sparkle. 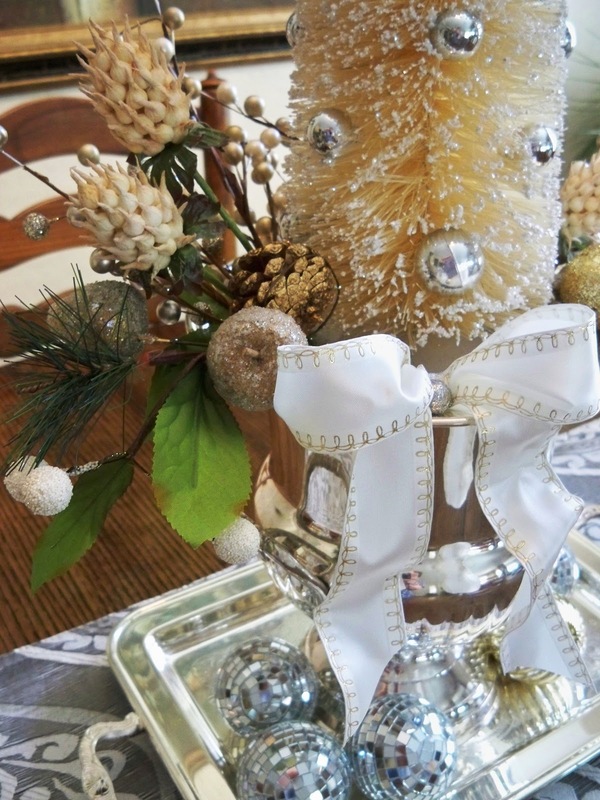 A Goodwill champagne bucket always makes a great vase and adds some glitz for the holidays. Fill the bucket with some floral foam, sit the tree on top and then surround with pearl spray, seed pods and glittered fruit. 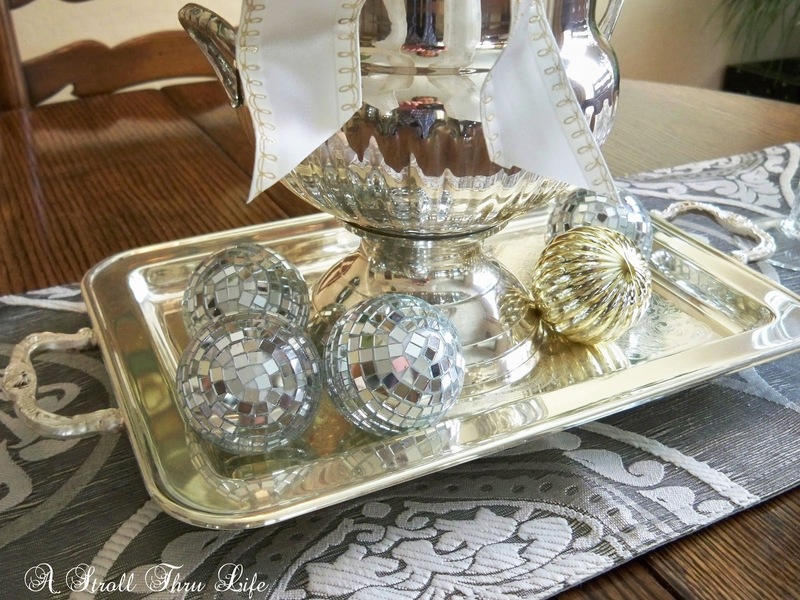 then place it on a tray (also from Goodwill )with a few glitzy ornaments. and finish off with a pair of candlesticks. Super easy, inexpensive and elegant. I am in full swing Christmas decorating mode at the moment. How about you? Mark your calenders, you don't want to miss a single post. These fabulous bloggers have some gorgeous decorations to share. So pretty Marty. 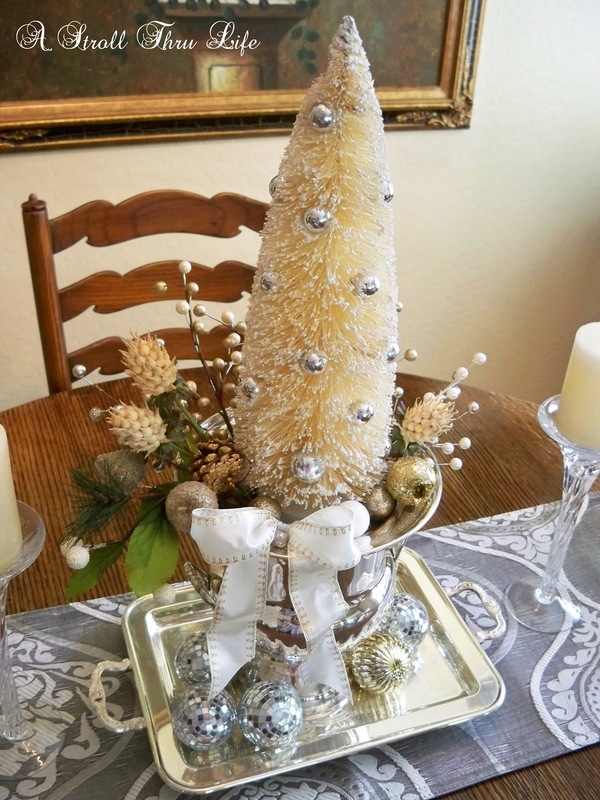 Love the champagne bucket for the base of your bottle brush tree. 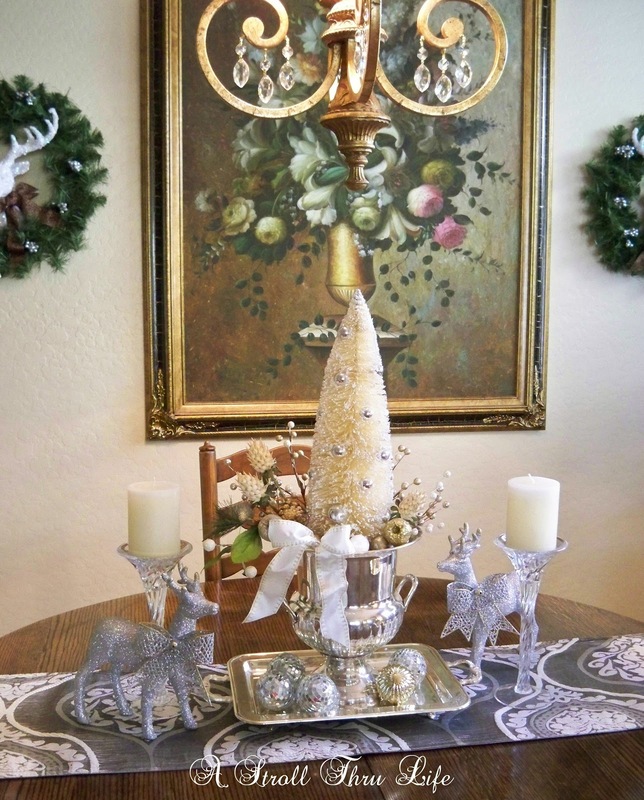 Enjoy getting your Christmas decor on! You are the queen of glitz and shimmer Marty! love your centerpioece idea. Can't wait to see your beautiful home all decorated for Christmas...I am sure it will be nothing short of stunning! Your centerpiece is simply lovely, Marty! 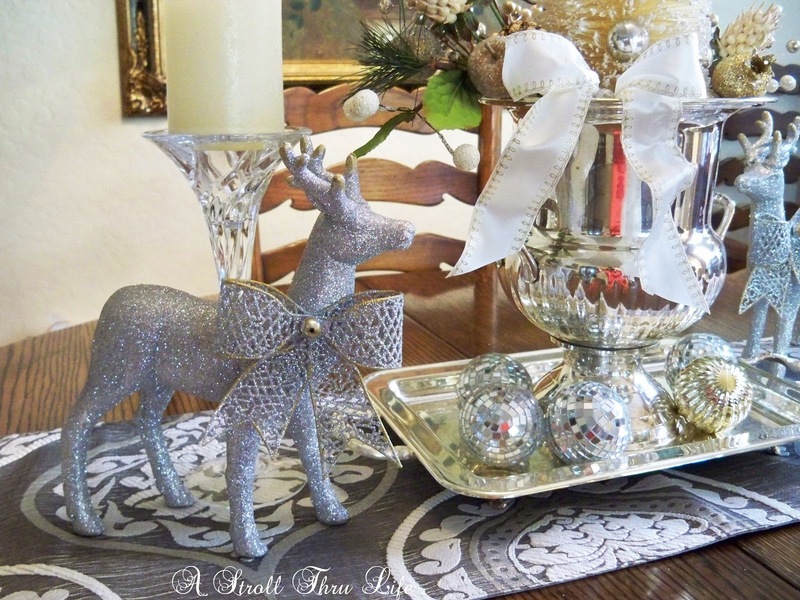 I really like the silver tray, very festive and sparkly!! Marty your centerpiece looks so pretty...I love how you filled your champagne bucket!! So pretty. I have something similar, but smaller. I still have to decorate! Marty, You knocked this one out of the park. I love your table centerpiece/arrangement. I like all of the sparkle and shine! Marty, your center piece is beautiful. I should have used my champagne bucket somehow in my decorating. You always have such wonderful ideas!. Marty, everything looks so pretty! I really love the gold and silver you are using. Love that bottlebrush tree. I'm so excited Marty, looks wonderful! 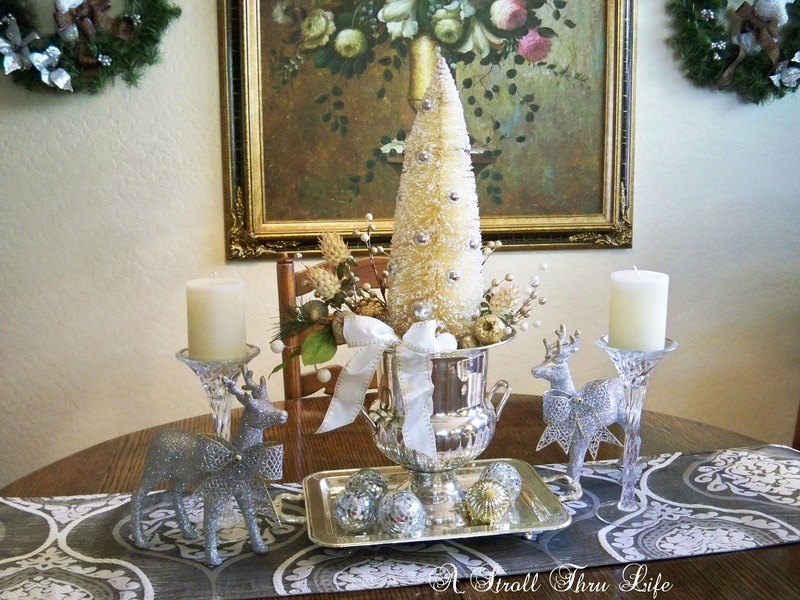 Really pretty, I love the silver, I am using white, turquoise and natural foliage this year. Marty love this! Must steal this idea for the champagne bucket..I have an empty one that could use a festive tree! Looking forward to the tour! Your centerpiece is lovely! I do love silver trays! You're the master of vignette design! Oh it is lovely. You can't beat the sparkle of silver. Very pretty, Marty! 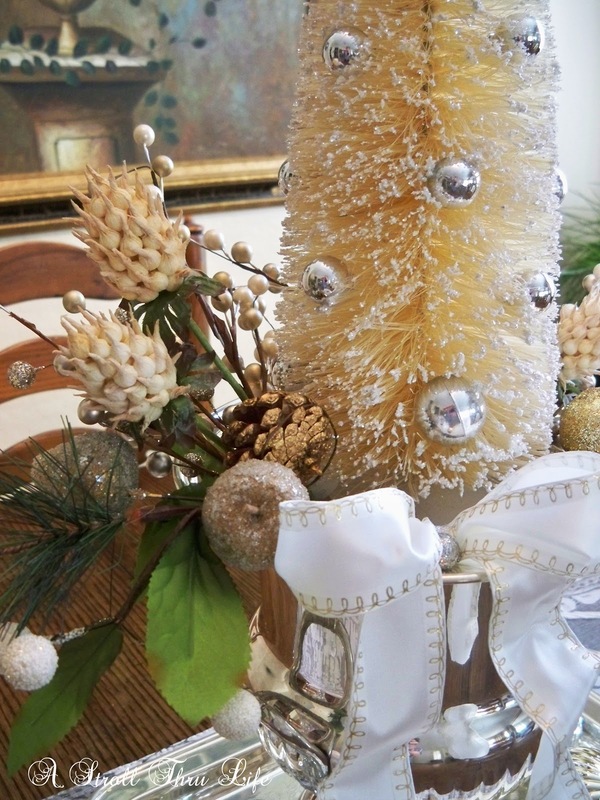 I love bottle brush trees in Christmas decorating, especially the bleached ones. Why am I drawn to the silver and gold this year, you have created an awesome collection of decorations with such beauty!!! I need to check out my dollar store for some things I could use. The Open House Blog Hop sounds exciting. Wow, thanks so much Gwen. I love to play with my goodwill and 99c store treasures. I think you can make them look amazing by mixing them up. I do like pretty things too, so fun. Beautifully elegant my friend but best of all easy peasy!!! LOVE the champayne bucket end tray. You have a GREAT GW!!!! I am all finished decorating: got it done before Thanksgiving this year. WHOO HOO!!!!!!!!!!!! 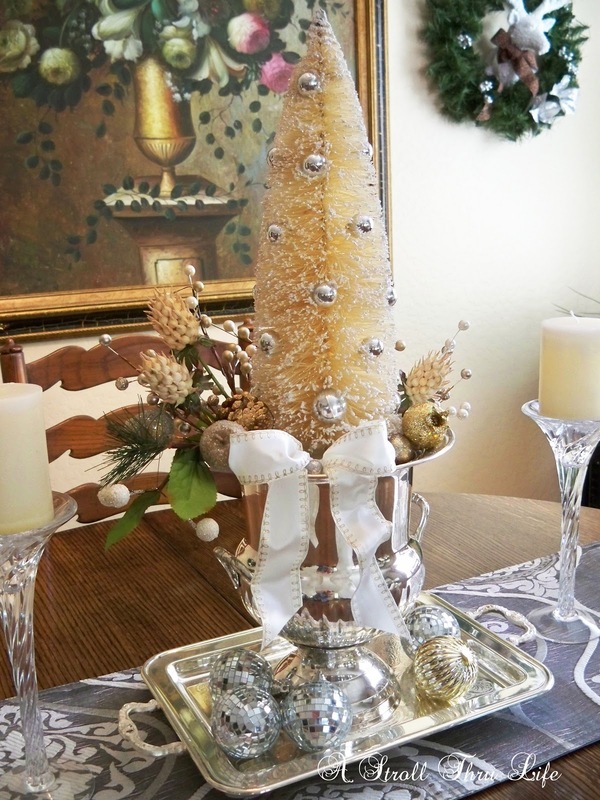 What an absolutely stunning and budget friendly centerpiece for the holidays! I am always looking for new ideas as I too love having something pretty on my table all the time, and also like you, I like to change it up often it's cheaper than redecorating the entire dining room when I want a change. ;-) Thank you for sharing this fabulous #diy with us on the Oh Heartsie Girls Wordless Wednesday Link Party. Here's wishing you an AWESOME week. Oh my! I just wasn't getting inspired to decorate until now. I am looking forward to a wonderful week of inspiration. I wish I found great stuff at Goodwill, will go back and search a little more I must be doing something wrong. Love what you've done so far! I'd like to get some of those bottle brush trees like you have with the little ornaments on them. Cannot wait to see all of the holiday decor! oh Marty, this is so elegant, love all the glitz, glitter, and silver! Bottle brush trees and a vintage champagne bucket. just gorgeous! Very nice Marty! Love the shimmer of your silver bucket and there is just something special about bottle trees, perfect combination!